and let alone twenty seventeen. That usually lasts about a week. A day really- a short social media day. It's the thought that counts I suppose. More often times than not at the beginning of all things "new"
we set super high expectations. Laundry lists of high expectations. penetrate my heart with nothing but a nagging feeling. just to weigh heavy on me and eventually wear me down. No one else even knows my little "be better-do better" list. The nonsense I draw up in my own head. well, needs an expectation check. It's been 11 years since the last baby and 13 years since the first. To say I was on auto-pilot is the understatement of the century. Days were filled and always busy but it was all doable. I'll take a very productive robot. For me, goals are everything. I set them, I struggle with them, I achieve them. I love to have them. staying focused on a single task until completion is quite complicated. But hot dang isn't he the cutest 3 month old you've ever seen? But that gently forced reminder is a darn good one. Keeps me real. Keeps me motivated. Keeps me grounded. I just have found a stronger appreciation for the "newer" version. For me it's a sign of growth, understanding and patience. All good things happen in time. All beautiful things develop with love. All goals are meant to met with hard work. All expectations are to be exceeded. Embraced through struggle, success and diaper changes. So February is my new best friend. Time to re-address the expectation. 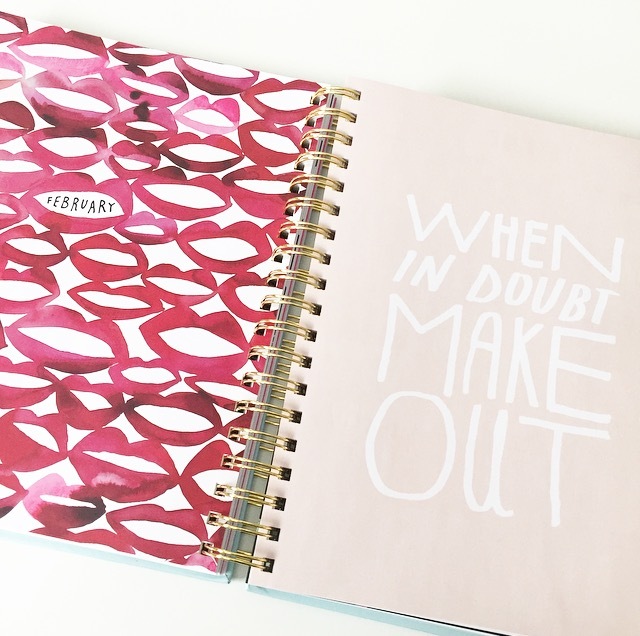 when in doubt, make out! if it's on the planner it must happen. Annnnnnd that is when I re-read this post. Baby steps to big girl dreams. Reminding myself of that little gem of a saying daily these days. it's just a firm reminder to take the time to love yourself- as you are. Piles of laundry and all.